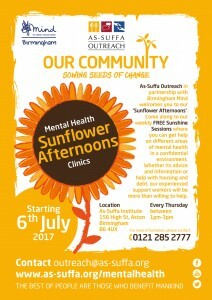 As-Suffa Outreach in partnership with Birmingham Mind welcomes you to our ’Sunflower Afternoons’. Come along to our weekly FREE Sunshine Sessions where you can get help on different areas of mental health in a confidential environment. Whether its advice and information or help with housing and debt, our experienced support workers will be more than willing to help.